Wing span: 1 3/16 - 1 5/8 inches (3 - 4.2 cm). 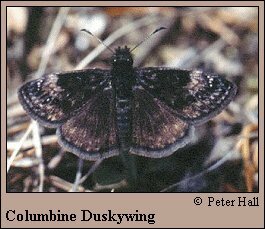 Identification: Upperside is dark brown; brown patch at end of forewing cell is indistinct. Underside of hindwing has marginal and submarginal rows of well-defined pale spots. Male has a costal fold containing yellow scent scales; female has a patch of scent scales on the 7th abdominal segment. Life history: Females deposit eggs singly under leaves of the host plant. Caterpillars feed on leaves and rest in shelters of leaves. Fully-grown caterpillars from the second brood hibernate. Caterpillar hosts: Wild columbine (Aquilegia canadensis) and sometimes garden columbine (A. vulgaris) in the buttercup family (Ranunculaceae). Habitat: Rocky deciduous or mixed woodland and edges, especially in ravines or gullies. Range: Southern Quebec and southern New England west to Minnesota; south to New Jersey and Pennsylvania; south along the Appalachians to Virginia and Kentucky.